New - Arrowleaf Lodge, at Empire Pass, in Upper Deer Valley's most exclusive area, adjacent to Silver Lake! Now reserving for 2018-2019 Ski season. Experience true ski-in, ski-out living! Located directly on the Silver Buck Ski Run, just above the Silver Strike Hi-speed Quad Lift. A private mahogany ski locker with boot heaters and ski storage is also included. All you need to do is put your boots on and walk outside. You are on the slopes! Our guests have been very satisfied with our unit. We encourage you to read the posted reviews. We designed our unit for use by our family and many friends. We rent our condo sparingly. We only rent during the ski season and not during the rest of the year. The condo is absolutely pristine and beautiful. We strive for every guest experience to be a memorable one. We treat all of our guests as we would treat our own family and close friends. This Arrowleaf corner unit is an ultra-luxury multi-million dollar three bedroom, three and a half bath, approximate 2,000 square foot condo. It has the largest floorplan and living areas of all Arrowleaf units! Each bedroom has a private bath and mountain views! The unit was professionally decorated by a renowned interior designer. All furniture was custom designed for this unit. The unit also includes original oil artwork by local Utah artists. No expense was spared. We encourage you to view the photos of the unit as it is nothing short of spectacular. All mattresses are of the highest quality for maximum comfort. Luxurious bedding with high thread-count linens are on every bed. The closets were custom designed with plenty of storage space. The bath towels are thick and luxurious. The dining room table includes seating for eight (8). Large and comfortable approx. 11' by 11' sofa in Great Room (great for a nap or just watching the brand new Samsung 55 inch 4K UHDTV by the fire with 4K Denon Receiver and 7.2 Surround Sound and Roku Ultra 4K streaming video). In summary, our unit was designed for use by our family and friends and is only rented for very limited portions of the ski season. It is a long-term investment and we designed it to be enjoyed by all. Our guests have included actors and executives in the entertainment industry. Arrowleaf has been recently written about in luxury travel magazines. We are proud to welcome you to our family's second home. Our unit has the best floor plan in the Arrowleaf complex and has the largest living areas. We encourage you to compare. When you open the front door, you will see the unobstructed gorgeous mountain views from the floor to ceiling windows in the Great Room. *A brand new Samsung 55 inch 4K TV (other units have smaller TV's) over the beautiful fireplace with custom surround sound, in-ceiling speakers (eight in total), Denon 4K receiver and Roku Ultra 4K streaming video with Netflix, Hulu and Amazon Prime video. All are controlled by programmed Harmony remote. DVR included! *A 55 inch LED HDTV in the master bedroom, with in-ceiling speakers over the king bed, with 4K Denon stereo receiver.. Both are controlled by programmed Harmony remote. *Samsung 40 inch 4K Smart TV's and with programmed remotes in the other two guest bedrooms. Netflix, Amazon Prime and Hulu included. *Satellite boxes are include HBO and Showtime. Further, unlike other units, our unit has a large custom stone deck overlooking the mountain's ski runs with two new Custom rocking chairs with custom cushions, table and teak loveseat. We also had a custom gas grill station with granite counter and stone on the deck. *Hi speed secured wireless internet access is included in the unit. A fax machine is also included in the unit. *Beautiful antique dining table with eight chairs. *Luxury Kitchen Appliances - Wolf Range, Sub-Zero refrigerator and 46 bottle Wine Cooler, Dacor Microwave and Asko, super quiet stainless dishwasher. *Gas Fire Place in the Family Room. *Jacuzzi tub and heated floors in the master bedroom. *Heated floors in the master bathroom with computer temperature controls. Wonderful on cold mornings. *Hand-trowled walls with custom painting. *Granite Counter tops in Kitchen and all baths. *Large Stone Balcony with Outdoor Custom Furniture and built-in Weber Gas Grill. *Two outdoor fire pits, with seating and three Hot Tub/Spas are part of Arrowleaf's amenities. *Large Patio deck in our building with waterfall flowing into custom fire pit. The patio deck seats approximately 50 people and includes multiple custom tables and dining chairs, adirondack chairs surrounding the fire pit and waterfall, two grilling stations and ten bar chairs around the grill station areas. The patio is a wonderful place to relax by the fire, cook outside and enjoy apre ski. *Private Ski Locker with boot dryers for four sets of boots, located in a heated locker room. 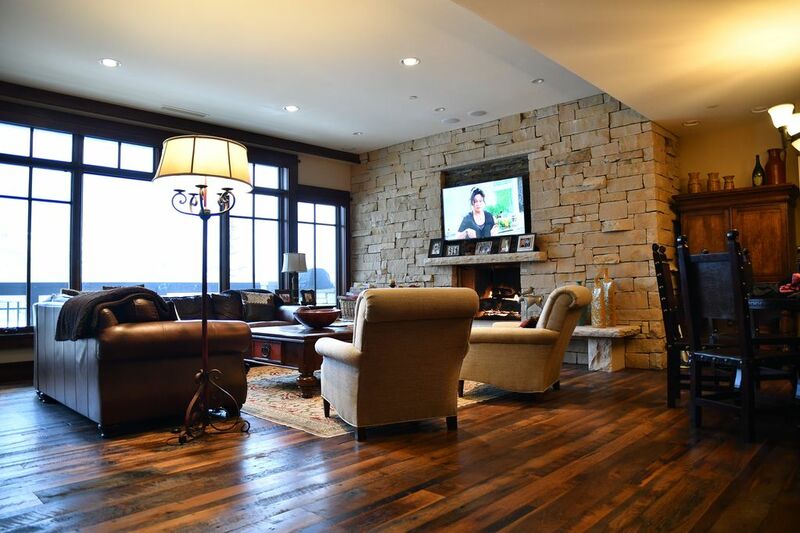 *Every Room has beautiful mountain views with floor to ceiling windows in the Great Room. *Plenty of board games in the unit for kids and adults. In the Hearth Room, located on the main floor of the lodge, you will find an antique pool table, darts, fireplace and cozy furniture. Two computers with free WiFi access, as well as a professional coffee/espresso/hot cocoa machine are also available for your use in the Hearth Room. All are free to our guests. The Arrowleaf condominium complex also includes three outdoor spas and two fire pits with seating in addition the the custom patio deck. Complimentary private Dial-a-Ride chauffeur service is included and will take you anywhere you want to go in the Park City area. This service will pick you up at your door and bring you back at your convenience. As an added convenience, daily ski passes can be purchased at the at the Silver Strike lift. Call us to discuss your travel plans. We want your visit to be a memorable one. We will be happy to assist you in any way. I have a wonderful family with a wife and three teenage daughters. We love coming to our slope-side Arrowleaf condominium. We visit during both the winter and summer months. Our time there is cherished by our family and friends. Our guests have all been absolutely thrilled with our property. We are happy that they also see it as a 'perfect' vacation property. We welcome you to our second home. My family has skied throughout the western United States. We visited Deer Valley about ten years ago and from that time have never wanted to go anywhere else. Deer Valley resort has first-class skiing (with amazing snow and grooming), great food and wonderful service. Deer Valley is five minutes from Main Street in Park City, which is lined with great restaurants, bars and shops. Deer Valley is also just 35 miles from Salt Lake City Airport, which has direct flights from most major cities. A friend of ours bought a Deer Valley home and invited us to visit in the summer. It was great-so much to do. That was it. We knew that we wanted to own property there because we would use it year-round. We waited for the Empire Pass development in Deer Valley to be approved and began looking at property. We chose our Arrowleaf condominium because of its great ski-in/ski-out location on the Silver Buck ski run and Silver Strike lift. We then hired an interior designer and customized it during construction. It has the best open layout with amazing mountain views. We couldn't be happier with our decision. Our friends who visit us are begging to come back. The location on the ski run and amazing mountain views are fabulous. The interior design finishes are outstanding. We watch the sun rise every morning from the great room, with the fireplace on. We never tire of this view. We then go to our ski locker and ski out of our building. What a great location! toilet, combination tub/shower, Double vanity with stone rain shower and jacuzzi tub. toilet, shower, Stone shower and private bath in queen bedroom. toilet, combination tub/shower, Twin bedroom with dbl. vanity and shower/tub. toilet, Half-bath in great room with custom stone sink. All bathrooms are beautifully appointed with high thread count body towels. All towels and linens are new. Located on the slopes at Deer Valley Resort. Ski in/out. Expansive mountain views with floor to ceiling windows. Located directly on the slopes! Ultimate convenience. Three separate units with separate temperature controls. Luxurious custom bedding with high thread count sheets. Duet washer and dryer in unit. Beautiful stone gas fireplace in the great room below the large HDTV. Elated private parking for our guests. Heated private garage for building. Free secure ultra-high speed internet. Luxurious towels are provided. The bedroom towels include body towels. All towels are brand new and very thick and absorbent. Free ulta-high speed secured WiFi included. Fax machine also included. Very large soft leather sofa which is approx. 10x10 feet. Two separate custom side chairs. Large antique coffee table. We also include soft blankets for our guests. This area can seat at least 10. Asko super-quiet stainless steel dishwasher. Keurig coffee maker with a carousel of different coffees included for your enjoyment. Fully outfitted kitchen with everything you need. Wine and scotch glasses included. Included bar in the great room. Top of the line with Wolf gas stove. Includes Subzero wine cooler with two zones. Keurig coffee maker with coffee included for your convenience. Beautiful custom round table with eight chairs. There are also three custom bar height chairs at the kitchen counter covered in cowhide. Four HDTV's in the condo. 55 inch 4K Smart TV in Great Room, 55 inch LED in Master and 40 inch 4K Smart TV's in each of the other bedrooms. All wireless. Wireless system with 4K Denon receiver, surround sound with seven ceiling speakers and subwoofer in the Great Room. Master bedroom has two speakers in ceiling with wireless 4K receiver. Awesome. Board games included for your enjoyment. Beautiful 100 year old antique pool table in lobby. Netflix, HBO and Showtime included. The balcony of our condo has a private Stone deck with built-in grill just for our guests. Our condo has a private Stone deck with built-in grill just for our guests. Three outdoor hot tubs and two outdoor fire pits located on the property. Huge outdoor heated patio with waterfall and fire pit , and granite and stone twin custom gas grilling stations. Our family really enjoyed this well appointed condo in Arrowleaf. Excellent location as you can ski in and ski out directly from this property. The condo was very nice with a spacious living area and kitchen plus it is completely stocked with everything you need. The owner is great to work with and was very helpful in assisting with recommendations and services for our stay. Plus there is a property manager if needed. The complex has a spacious ski locker room and our locker had boot dryers. This was a nice perk and so easy for storing our gear after coming in from skiing. Top notch and we will definitely stay here again. Thanks for the stellar review Jane. It will be our pleasure to have you return as our guests next season. We had an amazing time staying at Jay's condo during Presidient's Week. The condo has everything you could want-- spacious, big bedrooms, high end appliances, beautiful furnishings, nice bathrooms not to mention it has a great view! I didn't fully appreciate how convenient it is to have the use of the ski lockers (and boot warmers!!) right after walking in from the slopes. Trust me, waking up to dry and warm boots is amazing!! The ski-in/ski-out could not be more convenient. Jay was very communicative throughout the rental process, checking in to make sure everything was going smoothly. It is obvious he loves his condo and it is not simply a rental property. Jay and his family use the condo often, so he really cares about making sure it is kept in top condition. Having rented many VRBO units, this condo had to have been the cleanest yet. There is nothing worse then spending a lot of money only to find that it is gross inside. Jay's condo was sparkling! We have been coming to DV for the past 12 years and this was the best visit yet. Even if the snow wasn't amazing (which it was this year) we would have had a terrific stay. Jay is the best host to date. He is a caring individual, with excellent communication throughout the entire process. Can’t go wrong with this incredible location. Gary, I am glad that you chose our condo to celebrate your wife’s birthday. I very much appreciate your kind words. My wife and I try to treat our guests as family. We all share a passion for skiing and a the serenity of the mountains. We look forward to your return next season. Beautiful, cozy condo only steps away from the slopes. Well equipped with everything you need. The owner and property manager were extremely helpful and available. So many amenities made available while staying here. Can't wait to come back! Sonya. Thank you for your stellar review. My wife and are so pleased that you had a wonderful stay. We hope to have you return as our guests next season. Exactly as advertised. Awesome location. Very comfortable. The condo was terrific for our family of 5. The owner is very easy to work with and helpful. They take a lot of pride in their condo. House manger was extremely helpful. Ski lockers are very convenient. There is a complimentary shuttle to take you anywhere you want to go in Park City. Great service. All in all love we loved our time in Deer Valley and the condo was a huge part of it. Thank you!!!!! Stuart, thank you for your wonderful review. We hope hat you return with your family next ski season. Kind and attentive owner. Unit is in great condition.